This course aims to provide/equip family caregivers and domestic helpers with home-safety consideration to ensure safety of the elderly in their homes. 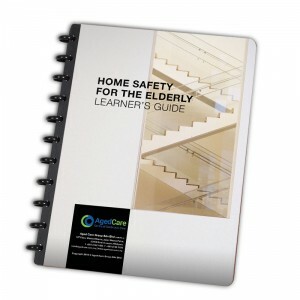 This module provides the caregiver with information on how to create a safe home environment for the elderly. Create awareness on what the elderly should do to prevent falls. Advise the elderly on ‘next-step-of-action’ if he/she has fallen down in your absence. Take simple action as a caregiver when your elderly care recipient had a fall. Take measures to prevent the elderly from falls in the home. Modify the home for the elderly with impaired mobility to reduce the risk of falls. Explain the effect of mobility in the elderly and advice on the correct walking aid. To complete this lesson, follow the guidelines and read the materials provided in this lesson. Click to obtain the LEARNER’S GUIDE in pdf file.